I'm very excited to share to you my new desk set up that helped me focus and boost my productivity every single day. Before we revamped my room, everything was a mess. I have sticky notes and pens in different places. The chaos was very real! I spend hours at my desk blogging, writing on my planner and making important decisions. And I believe having a tidy desk can boost one's productivity. 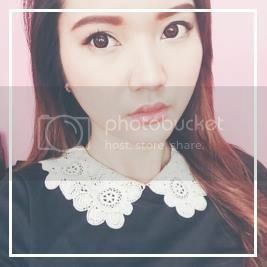 So here I'm sharing you some tips on how I managed to organize mine. Remove everything on your desk! This will help you see what you have, remove things you didn't need and will give you the option of changing the look and feel of your desk. You can paint it if you want to. Changing the look and color or your desktop will also affect your productivity. Especially if the color you are using is the one you really wanted. Like for me, I like it clean and white. 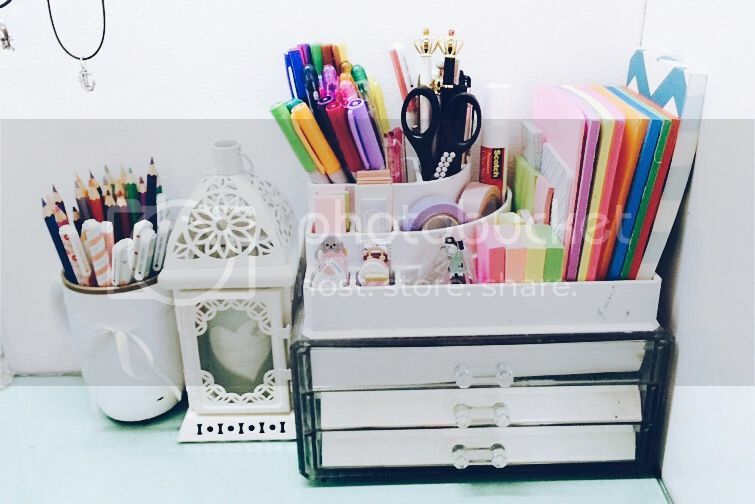 You can buy desk organizers and containers in your local school supplies store. Or if you have drawers, you can make your own DIY compartments from cereal boxes and decorate it with pretty paper or fabric. 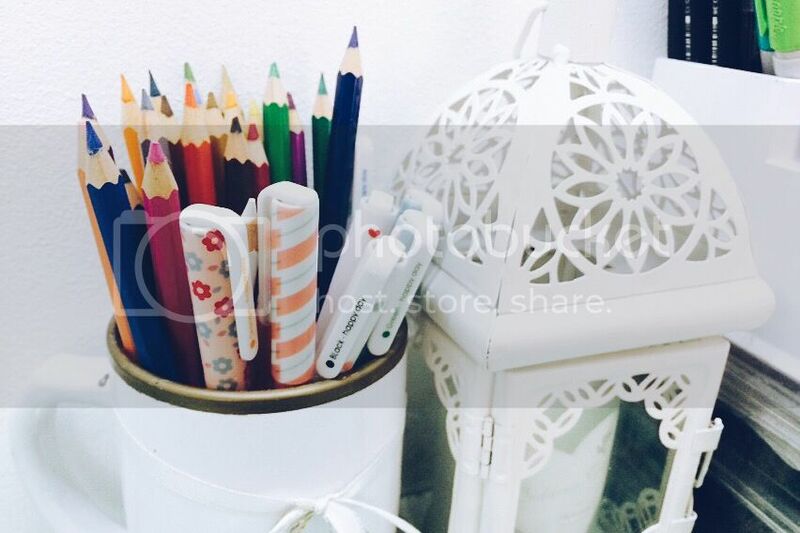 You may use your favorite mug for your pens and highlighters. 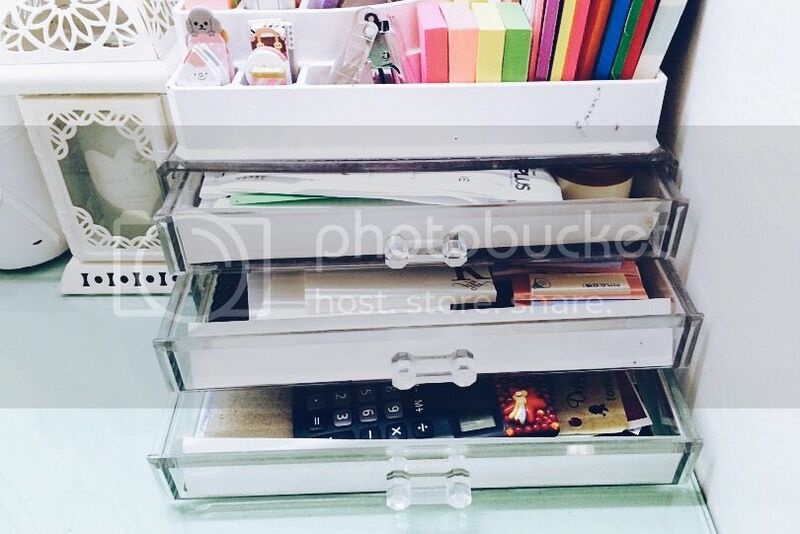 Or if you want to invest for a good organizer, you can buy those acrylic type of containers. You'll be more likely to keep things neat by doing this. Since you removed everything from your desk, you'll be able to see what you have and what you need. Set aside the things you won't be needing but keep them organize as well. 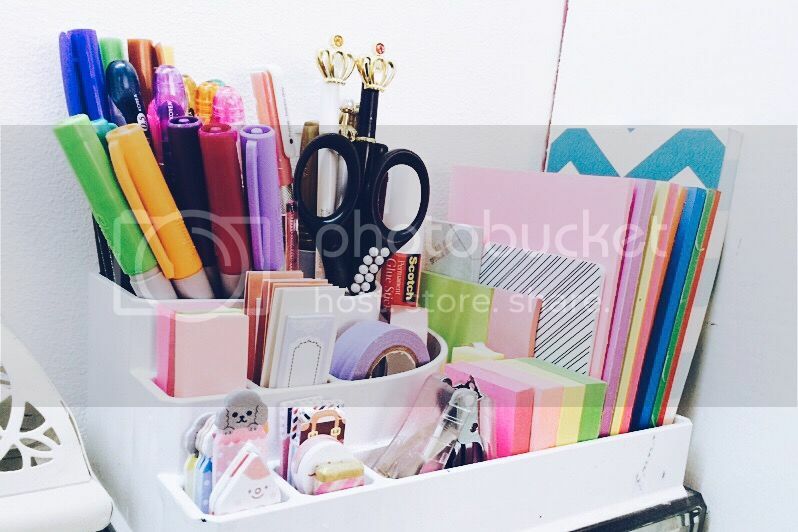 Make a small bin of things you think you will be needing every time you are working on your desk. These things should be kept near you. Easy access is the key. You can make a list of the things you need to buy for your desk but make sure to consider reading my 3 Practical Ways of Shopping before doing so. If you decided to use containers with lids like those condiment cups that you can buy at grocery stores. I suggest you label them. Condiment cups are perfect for pins, staple wires, clips, keys, batteries, etc. Add a space for a few file folders. I'm using this little acrylic drawer to sort out my receipts and bills. Throw away the ones you didn't need. Usually those receipts that are too old to keep. I kept most of my new planner inserts in this little drawer. So whenever I want to refill my planner I just grab a few pieces of my premade shopping list page and ring bind them with the rest of the pages. So far, this type of system is serving me well. Now get out there and organize your desktops! I would love to see yours *it may sound creepy* but if you are willing to share, just tweet me a photo of your organized desk at @imisskatv. If you want some quick decorating idea you can check out Buzzfeed's article. These look great ^_^ I think I will organize my desk right now! Thank you for this awesome useful post! Believe me, I'm the worst at taking care of plants! That's why I only have succulents and cacti - they make wonderful indoor plants with low maintenance! your tips are super helpful!